Dahlia ‘Suffolk Punch’ dressed in crimson red! 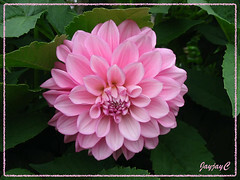 Plant type: Annual flowering shrub, from dwarf species (known as Lilliput dahlia) of 1 foot to giants of 7.5 feet tall. Even blooms ranges from 1.5 ins. to more than 1 foot in diameter! 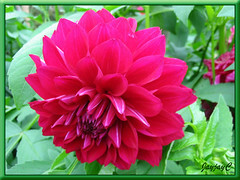 More plant info and images: See here for plant profile and here to know more about the official dahlia classification and full explanation! 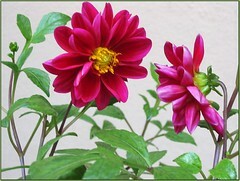 This wonderful site provides very helpful info on dahlia care and culture. Finally, relax and enjoy this photo gallery to your heart’s content! Hehe, I’m not sure whether our lovely crimson-red dahlia as shown in picture is correctly named as Dahlia ‘Suffolk Punch’ as identified from image found at this site! What I’m definite is I love this beautiful dahlia that never seems to fail me with its lovely blooms! :) Could be a lilliput dahlia, which is usually less than 15 inches (45cms) in height and with flowers not normally bigger than 2 inch diameter! Mine definitely fits this description, though my blooms are slightly larger by another 0.5 inch! 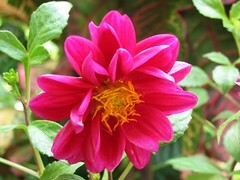 However, I’m undecided about its type – is it a peony, water-lily or double-layered (duplex) dahlia?? 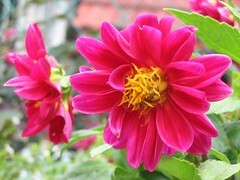 Sharing below are pictures of Dahlia flowers, a crimson red and sweet baby-pink variety that were seen in Tanah Rata, Cameron Highlands during our recent weekend vacation there. Blooms were about 5″ across and fairly large, on 4-5 ft tall shrubs that needed staking.